Sidney Crosby has agreed to terms with the Pittsburgh Penguins on a 12-year extension worth $104.4 million US, the club announced in a press release Thursday. Sidney Crosby's superstitious nature and desire to win another Stanley Cup appear to have worked in favour of the Pittsburgh Penguins. While the $104.4-million US, 12-year contract extension he agreed to on Thursday is clearly a massive haul, the NHL's most recognizable player could certainly have fetched more. Consider that the new deal will carry the exact same $8.7-million annual cap hit as his current one. It didn't end up being a tough set of negotiations for Penguins general manager Ray Shero and agent Pat Brisson of CAA Sports. "He just came back after he talked to Pat, near the end here, and just said 'This [salary] is really what I want to help out with the team,'" Shero said on a conference call. "We certainly appreciate and ownership appreciates that. It's very beneficial and says a lot about Crosby." Born Aug. 7, 1987—8/7/87—Crosby has long been drawn to those numbers. He's the only NHL player who wears No. 87 on his sweater and if he plays through the end of the extension, he will have enjoyed 17 seasons with an $8.7-million salary cap hit. It remains to be seen whether he'll see the end of that deal. Brisson acknowledged Thursday that the contract was structured to pay more in the front portion and Crosby would be 37 when it expires. One thing that is clear is that he's unlikely ever to play for another NHL team. "Sidney wanted to be a Penguin forever," said Brisson. "Emotionally, he's extremely attached to the fans and the city of Pittsburgh and the organization," he added. "When you're negotiating a contract of this magnitude, as a player it's important to understand what you want and where you want to be. Sidney understood that from Day 1." Under the terms of the collective bargaining agreement, the extension can't officially be signed Sunday. It comes into effect for the 2013-14 season. Crosby could have asked for the league maximum of roughly $14 million per season, but instead decided to remain the NHL's second-highest paid player. Washington Capitals captain Alex Ovechkin earns an average of $9.53 million while Crosby and teammate Evgeni Malkin each get $8.7 million. However, by signing for less than market value, he left the Penguins in a good position to make a strong pitch for Zach Parise and Ryan Suter when free agency opens on Sunday. "We'll be making phone calls," said Shero. "A lot of other teams will be [too]." Despite playing a total of 69 games over the last two seasons because of concussion problems and a neck injury, Crosby is still considered by many to be the top player in the game. He had two points or more in 13 of the 22 regular-season games he appeared in last season—finishing with a total of 37 points overall. The deal comes with relatively little risk for the Penguins, who would receive salary cap relief if Crosby were to be sidelined again. Shero declined to comment when asked if the contract was insured. "That's a team issue and we'll deal with that internally on any of these contracts," he said. Since entering the NHL in 2005, Crosby has averaged a league-best 1.4 points per game—Ovechkin and Malkin are next best at 1.23—while cramming his trophy cabinet with hardware. He has a Hart Trophy, Ted Lindsay Award, Rocket Richard Trophy and Art Ross Trophy. 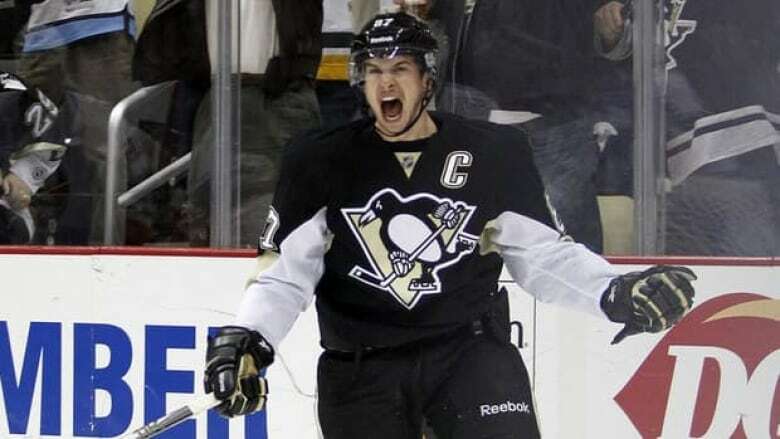 Crosby also became the youngest captain in NHL history to win the Stanley Cup in 2009 and scored the golden goal that lifted Team Canada to victory at the 2010 Olympics. The 24-year-old has spent the last few weeks working out in Los Angeles and Brisson says his mindset is "night and day" compared to where it was last summer, when he was still dealing with the effects of post-concussion syndrome. Shero believes that's a positive sign for the Penguins, especially after the dominant manner in which Crosby finished up the season. "We believe the best days are going to be ahead here."